Jem Top’s certified installers will complete every job to your satisfaction. We not only install new but will also service and repair as well. With a combined 40 years of experience, our installers take pride in their work from basic installs to custom requests. With so many accessories available online at discounted prices, we know it is hard to pass up a good deal. But with today’s trucks and all the different new body styles, sizes and factors, it is hard to fit out of the box. No two trucks are the same. Every new truck body style is a learning experience. Things change all the time. No two trucks are the same. This is where we come in. We have the resources to custom fit any cover that doesn’t fit out of the box. We have a whole shop full of “I know what will work”. Shims, gaskets, brackets etc. Everything we sell, we install, this includes: fiberglass tops, commercial aluminum tops, hard and soft tonneau covers, alternative covers, racks, running boards and much more. Whether you use your vehicle for fun, business or have a full fleet our expert staff can install the perfect product for your needs. Jem Top has been installing truck caps and accessories for a long time. With experience comes expertise. We are a family owned and operated business specializing in products and installation services for pickup trucks, vans and SUV’s. And we take pride in our work. Each truck is different, and each customer’s needs are unique. Why trust the internet to know what’s best for you, instead come visit our Lake Zurich showroom where you can see and feel the exact product you will walk away with. 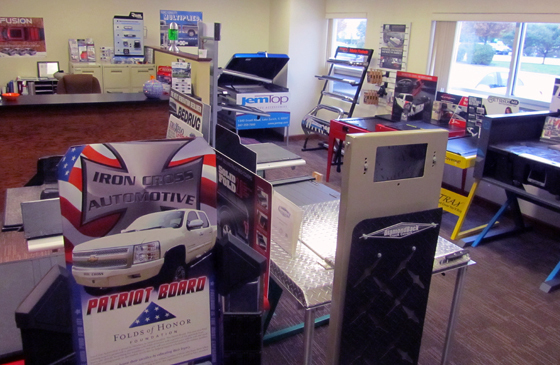 Each product in our showroom is top-quality and backed by warranty. Our experienced and professional team is standing by to fit your truck for exactly what you need!